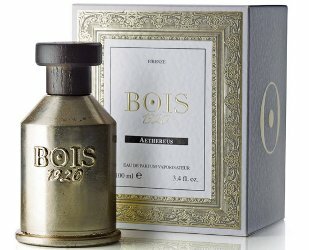 Italian niche line Bois 1920 has launched three new fragrances: Aethereous, Spigo 1920 and Verde di Mare. Aethereous (shown) ~ "an explosive citrusy debut smoothed by Coconut Cream Sorbet and sustained by the soft and elegant embrace of narcotic tuberose." Additional notes include mimosa, bergamot, lemon, orange, bamboo, geranium leaves, rose, ylang ylang, cedar, Peru balsam, tonka bean and vanilla. Spigo 1920 ~ "The aromatic character is the key of the heart. This accord is composed by sophisticated and intense quality of essential oils and absolutes of lavender and lavandin grosso." Additional notes include lemon, bergamot, cardamom, pineapple, tangerine, juniper berries, metallic & ozonic notes, basil, frankincense, geranium, clary sage, white musk, ambrette, cashmere wood, woods, myrrh, sandalwood, coumarin, cedar, vanilla and amber. Verde di Mare ~ "a fragrance that talks about travels, overseas lands, uncontaminated nature..." The notes include lemon, bitter orange, bergamot, lime, galbanum, pepper, juniper berries, marine notes, rose, geranium, muguet, black currant, black tea, petitgrain, carnation, woods, labdanum, vanilla, mate tea, musk and amber. Bois 1920 Aethereous, Spigo 1920 and Verde di Mare are available in 100 ml Eau de Parfum.